90% of the the removals we complete require the use of tools and equipment with competent staff to successfully complete the job. This could be simply removing the feet from a sofa to allow it to pass through the door way or completely dismantling and rebuilding sliding door wardrobes. 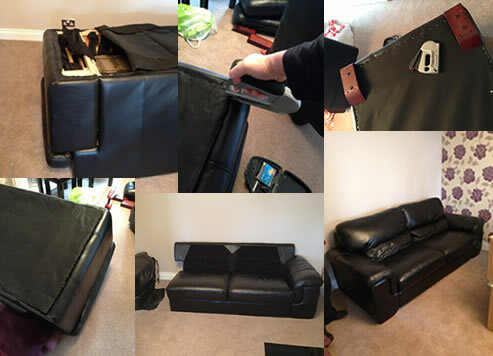 We can remove/refit the arms on your sofa dismantle/rebuild beds cots and other various flatpack furniture. 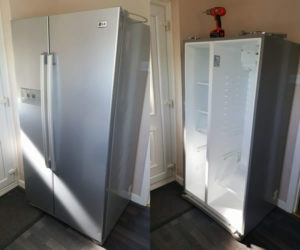 We took the doors off then re-fitted them on this fridge to make sure it would fit into it’s new home. We can remove/refit the doors from American fridges un-plumb washing machines dismantle and rebuild slate bed pool tables even take down a shed and rebuild it with new roof felt if needed. We may need to build a ramp to allow access for a specialist item take a window out or remove/refit a balcony railing to allow access into town houses. What ever the task we can plan it and take care of it for you. We have a good range of tools with us at all times and our skilled staff are all more than capable of doing it safely and efficiently.